The consortium is shaped on the basis of five principles such as complementarity, excellence, commitment, balance and sustainability. All the participants have wide experience in international cooperation including the previous European Programmes. The impact strategy of PEESA III requires a European level approach. PEESA III aims to contribute to the vision of the Digital Agenda 2020, by fostering a deeper usage of ICT for smart, sustainable and inclusive engineering education and traning. The project requires the integration of several areas of expertise, approaches, and application domains ranging from motivation theory, flexible learning paths such as distance and blended learning, quality management, university-business co-operation, behavioral economics, user modeling, education digitalisation and digitisation, social media management, game design and gamification, data integration. no a project on engineering education aimed at Southern Africa. Thus, the building of human capacity in general and educator capacity in particular in engineering education in Southern Africa has not received any attention. In order to fill in this lacuna, PEESA III will contribute to the enhancement of the capacity of educators in engineering education, capitalizing on mature methodologies and technologies combined under novel social innovation schemes, namely socio-digital approach. PEESA III demonstrates the overall concept for educators’ capacity development via training/coaching/mentoring/etc, indicating how the steps of the process are related following a logical chain: 1) analysis of student needs (educator and business awareness and feedback, European standards, etc), 2) data analysis, 3) educators’ hybrid (traditional, on-line, etc) engagement (regional government, company visit, digitalisation, European standards in engineering education, flexible learning paths, etc), 4) student friendly degree programme modelling, 5) intelligent quality management. PEESA III solution for educator training proceeds from Consideration of individual, social and economic achievement in Phase 1 through Hybrid (traditional and on-line) adaptive educator training in Phase 2, Hybrid (individual and social) goal setting in Phase 3, Degree programme adjustment in Phase 4 to Context aware recommendations for sustainable maintenance of degree programs in Phase 5. 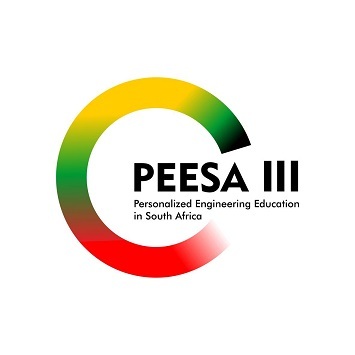 PEESA III will implement and validate an integrated socio-ditigal approach to the capacity building of educators in engineering education for personalisation of engineering education in Southern Africa, by developing innovative student-friendly degree programmes for making smart, sustainable and inclusive engineering education available for the different users and stakeholders (prospective students, students, employees, business, ICT providers) empowering them to collaborate to enrich the capacity and manage their needs in engineering education in efficient and sustained ways.